To begin, I must admit first that I am very much a fan of Hayao Miyazaki's films. Apart from Pokémon, which I had seen a few years earlier in early middle school when it was first released in the United States, Princess Mononoke was my first exposure to anime. That film is still a little too violent for my tastes, but I have had a favorable disposition towards Miyazaki ever since. 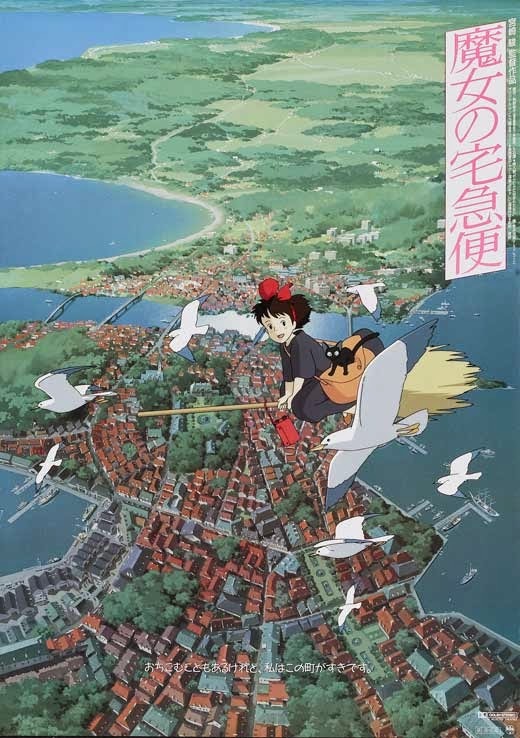 As in many of Miyazaki's films, Kiki's Delivery Service features a young girl as the protagonist who learns to make her way in the world. In many ways, the film is a full course on Miyazaki's particular style: beautiful frames, drawings, and animation; multiple empathetic characters; intimations of a vast world only mentioned in passing in the lens of the film; flight as both visual motif and metaphor; and time for meditation and reflection, both for the characters and for the audience. That last -- where Miyazaki lets us as viewers see the beautiful, simplified, romantic landscapes of childhood imagination -- is perhaps what lends the film so much of sweetness and innocence; with the characters, we are allowed, for a moment, to see the world as children again. d from pre-adolescent witches on brooms.